Early reviews of Tony Kushner's new play--premiering at the Guthrie--are split but give an intriguing glimpse of a new direction in the playwright's work. The action is all naturalistic, with long scenes that play out as family drama, roaring emotion clashing with decades of unspoken resentment; the feints, parries and misdirection of contemporary communication are rendered in lavish detail. To say Kushner is working at a high level is an understatement. Every passion in these characters' lives is a contradiction, each pleasure arriving with thorny conditions. And in fusing the thunderclaps of intense family life with the politics of labor (including the biological kind), the writer connects the mundane and the lofty with a scope that suggests an affectionate nod to English-language naturalists such as Arthur Miller. Ultimately, Kushner leaves himself open to charges of overreaching, unfocused ambition, perhaps even hubris. But that's to be expected when aiming for this kind of scope. Kushner's great themes are here: change, work and the understanding that every element of life shifts when held up at a slightly different angle. Performed by lesser talents, the work would likely be an unbearable mess. But this premiere production (the centerpiece of the Guthrie's Kushner Celebration) aptly uncovers the play's restlessness, striving and unapologetic requirement to work through the circles of its own mad but hauntingly real complexities. Director Michael Greif has given Kushner a good look at what he's written. The lines sound great in the actors' mouths, their performances are excellent and Greif dances this show across the Guthrie stage with humor and muscular strokes -- fighting the script's occasional exhausted ennui. Now the playwright can set his hands to clarifying his irresolute intentions, for Kushner has not yet discovered his own purpose in writing this play. It is a very American work -- a dense rush of ideas and diatribes about the working man, wealth, spiritual unease and meaningful purpose. Gus finds his exaltation in union wages and justice rather than sales commissions, but he lives only a subway ride away from Willy Loman. The similarity, however, points up an important distinction. Arthur Miller and his American realist cohorts -- Tennessee Williams and Eugene O'Neill for example -- used dialogue as a scalpel to cut their characters open. Kushner's strength always has been proclamation -- bold and at times preachy in its ambition, epic in its spectacle and sprawl. In this milieu, his operatic cacophony at times skates precipitously close to the razor's edge of incoherence. The wash of recitative becomes more of an irritant than a revelatory acid. 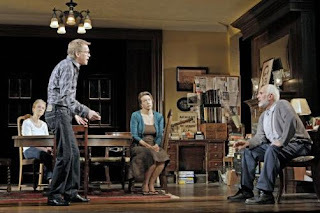 The play's title, by the way, The Intelligent Homosexual's Guide to Capitalism & Socialism with a Key to the Scriptures, constitutes Kushner's second knock-off--sorry, homage--to George Bernard Shaw. You can even watch audience postshow reactions here.